Certified to NSF 42 for the reduction of Chlorine, Taste and Odor. Certified to NSF 372 for lead-free compliance. LMXC24746S, LMXS30746S, LMXS30756S, LMXS30776S, LSC22991ST, LSXS22423B, LSXS22423S, LSXS22423W, LSXS26326B, LSXS26326S, LSXS26326W, LSXS26366S, LSXS26386S, LSXS26466S, LMXC23746D, LMXS30776D, LMXS30786S, LNXC23726S, LNXC23766D, LNXS30866D, LPXS30866D, LPXS30876D, LSXC22326S, LSXC22336S, LSXC22386D, LSXS26336V, LSXS26366D, LSXS26386D, LSXS26466D, LUPXC2386N, LUPXS3186N, LMXC23746S, LPXS30866S, LSXC22386S, LMXS30776, LSXS22423. 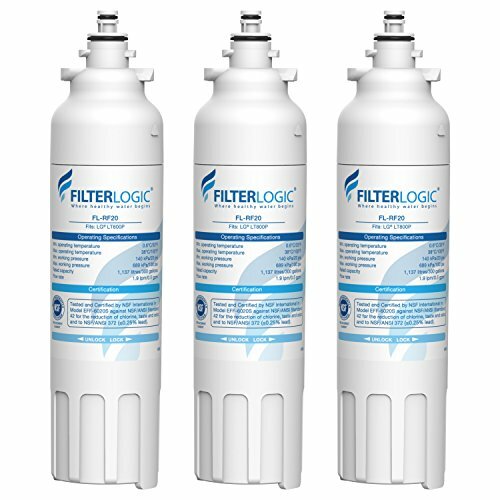 FilterLogic offers unconditional 30-day money back guarantee. Our professional customer service team will take care of your problem in a timely manner. Replacement for LG ADQ73613401, LSXS26326S, LMXC23746S, WF-LT800P, LMXC23746D, LSXS26366S, LMXS30776, LT 800P, LMXS30776S, LT800PC, LSXS22423S, LSXS26386D, LT800P, ADQ7361340, Kenmore 9490, 46-9490, 469490, ADQ73613402. This filter is not the original product.